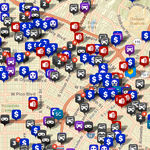 Part community bulletin board, part crime-solving lead generator, the interactive map below details all criminal activity in Los Angeles in real time. Not sure how to use it? Read on. 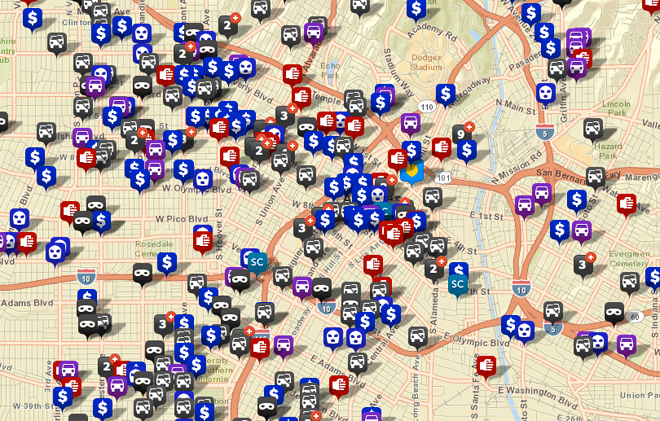 Click image to open the LAPD Crime Map. Click on your state to select a law enforcement agency. You can read the map in traditional or satellite view. Pick an option in the top right corner of the map. Click on the date range at the top of the page to adjust it. The map will display crimes that have occurred within the selected time frame. Click on the “Crime Types” tab at the top of the page to view the different crime icons. Run your cursor over the icons to see which type of crime each icon represents. Use the checkboxes to add or remove a type of crime from the map. Type your address into the search bar at the top of the page to view your immediate area. Adjust the radius, using the pull-down menu to view crimes within the desired distance from your address. Click on an icon on the map to view more details. An icon with a number indicates multiple incidents at the same location. A pop-up window will tell you the type of crime that has occurred, its case number, the date and time of the crime, its location, and a brief description of what happened. To see how far you are from a crime’s location, click the “How close am I to this location?” link at the bottom of the pop-up window, and type in your address. A satellite view of your area is indicated by a straight line connecting your address to the crime’s location. You can view a trend report by clicking the picture of a graph that appears in the top right corner of the page. The report can be printed or forwarded by e-mail. Opt to receive crime alerts via e-mail by clicking the orange “Receive Crime Alerts” button in the top right corner of the page. Alerts can be customized by area, radius, and type of crime.